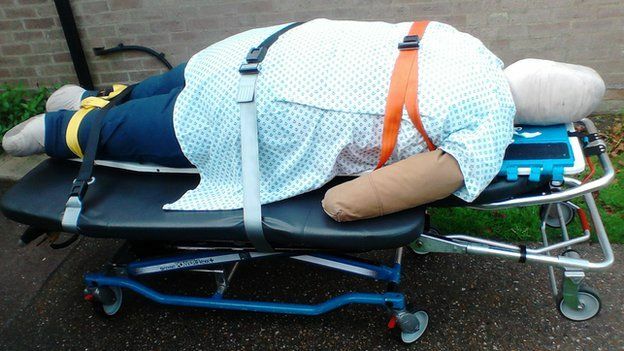 SOURCE: BRISTOL POST – An emergency response to an obese woman who died after being taken ill at home was delayed, because paramedics had to search for a bigger stretcher to take her to hospital.Relatives claim more should have been done to help Bridgette Witcombe and have criticised paramedics. But South Western Ambulance Service has insisted its staff acted “with care and skill”, after a coroner found that the 52-year-old died of natural causes. An inquest yesterday heard paramedics had to search first for a bigger stretcher, then find an ambulance to accommodate it, because Mrs Witcombe, of Longacre Road, Whitchurch, would not fit a regular stretcher. Avon Coroners Court heard that Mrs Witcombe had been vomiting repeatedly over 24 hours before the ambulance was called. The court heard the mother of three had struggled with various weight problems and medical conditions for more than a decade. At one time, she weighed about 198kg (31 stone).